The Tarot Deck advises us in many ways. 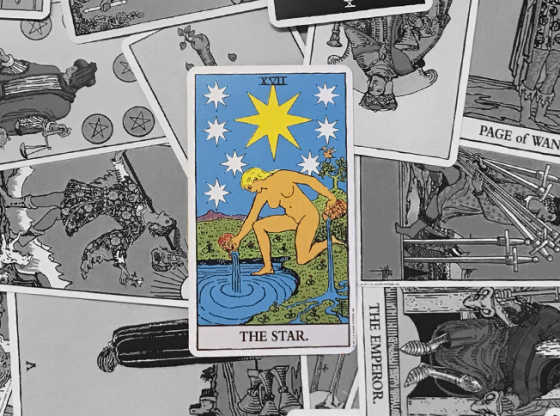 The spread of cards before you is a layering of outlooks on your consciousness. 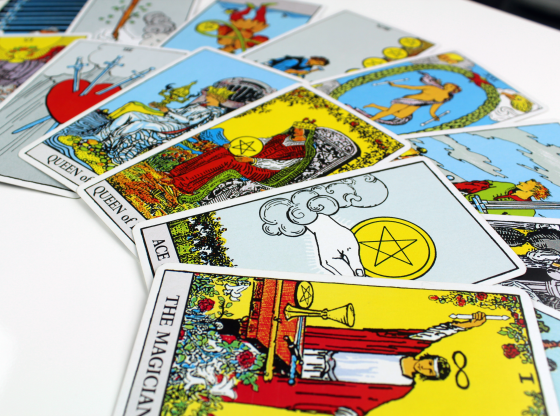 Tarot cards are organized by suits, as well as by numerical order. 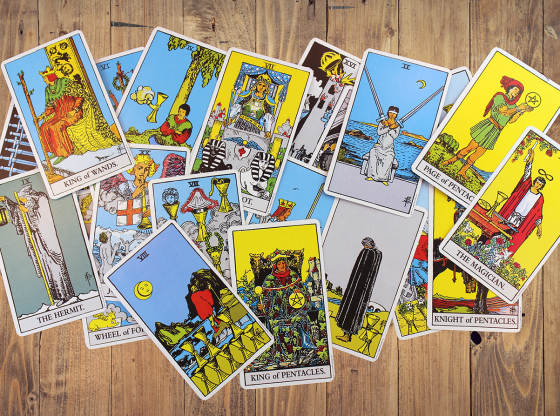 Cards often carry illustrations of the same object, animal or type of person. All of these illustrations and subsets mean something. 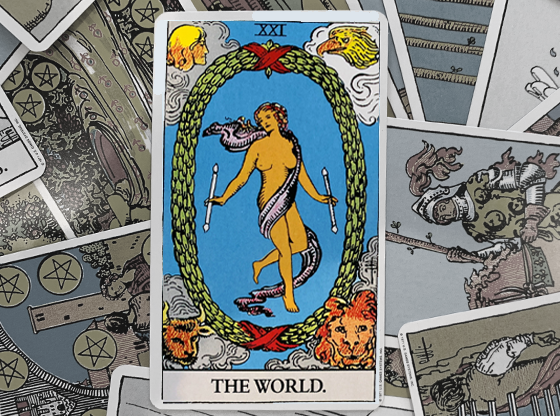 The universe is organized in an epic manner and the Tarot’s intricacy delivers this energy. As we search and seek and gain desire for things to be a certain way, we often ignore boundaries. It is good to know your limitations and accept what can and cannot be done. 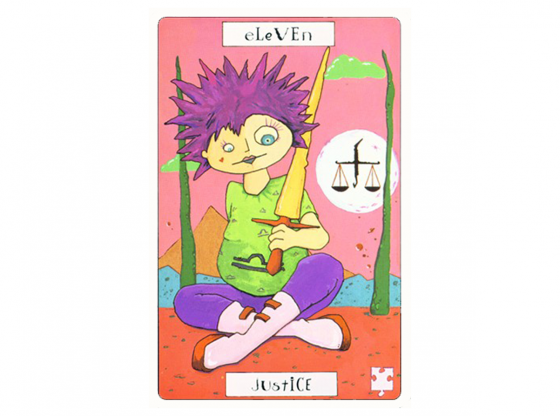 The number Eight in the Tarot deck describes boundaries, limitations and situations that are inherently intractable. 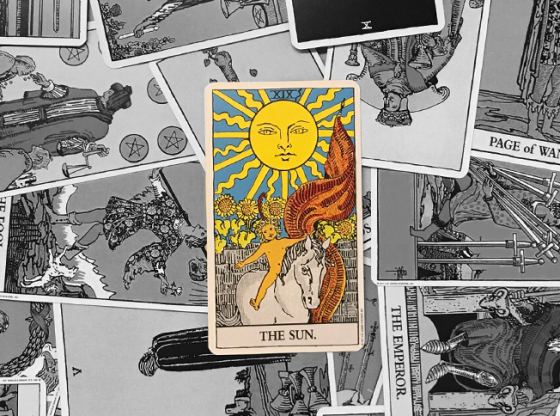 There are six cards in the Tarot deck with the number eight and each of them depicts a situation where you can gain by simply understanding the boundaries in a given situation, relationship or an important area of your life. 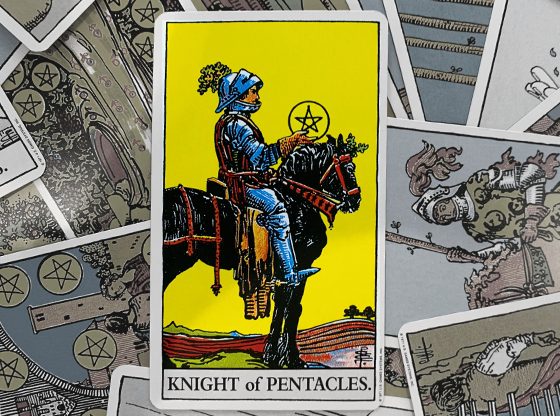 In addition to two cards in the Major Arcana (Strength, numbered 8 and The Moon, numbered 18), there is an Eight of Swords, Wands, Pentacles and Cups. 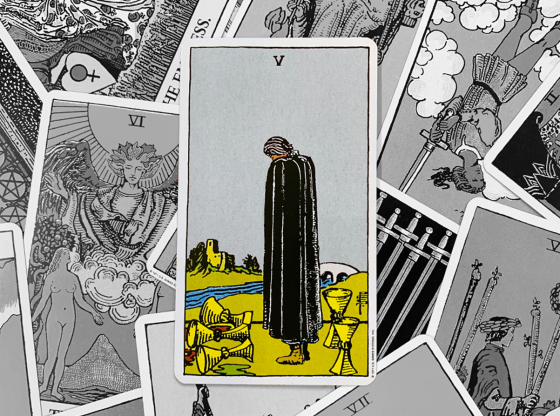 Read below to see the boundaries that each one of these eights signifies when it appears in your Tarot reading. . 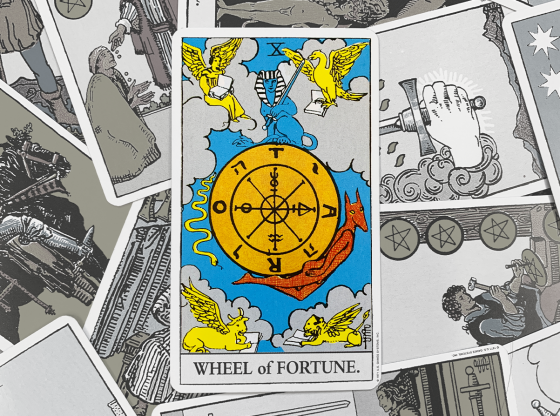 This card is the foundation of the other cards bearing an eight that follow it. It truly asks you to know your own strength. Are you taking on too much? Are you disorganized and in jeopardy of losing everything you have? The card shows a woman petting a lion. There is no display of physical intensity in this picture. The woman’s inner strength has caused the king of the beasts to lovingly submit. Knowing when to give in is just as important as knowing when to politely take control of a situation. This is the card of the animal part of our brain where intellect and reason are controlled by emotion and instinct. When this card appears you will be forced to deal with your gut feelings and how they interfere with your daily routine. Are you blocking yourself from success because you are wallowing in negative emotions? Understanding self-awareness can open your eyes to seeing how your behavior affects everyone else as well as yourself. This is a card that insists you develop empathy for others. The bright blue sky shows a groundless scene of eight walking sticks, or wands, being tossed in the air. Are they rising or falling? We do not know. But what we do know is that there are too many of them to control. When you are feeling creative, you often have many great ideas. 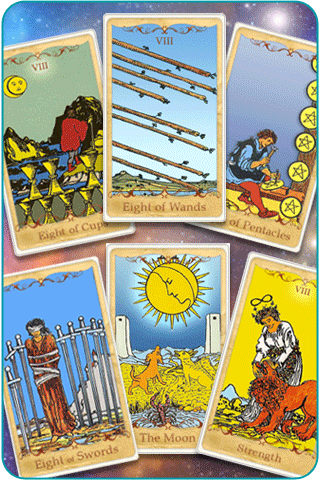 The Eight of Wands illustrates how having too many options can often simply lead to chaos. This is the card that insists you move on from an overwhelming emotional situation. In connecting with the emotions illustrated in card number 18, this card illustrates the face on the Moon watching a man leave behind a stack of cups. 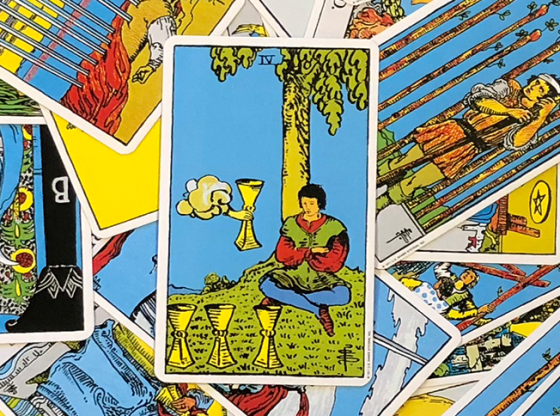 Cups are the Tarot’s indicator of emotions. Where others may try to establish an intimacy that you neither want nor should allow, you must enforce boundaries. The thing to do is to simply walk away, to anywhere else, as a way to establish good boundaries. The limits of love and friendship should protect your emotions, not leave them vulnerable. The gloomy slate gray sky underscores that boundaries ignored can lead to isolation. Swords represent ideas and communication. Often our harsh words or attitude will cut us off from other people. No matter how deeply dear an idea or philosophy may be to you, other people who see it differently are entitled to their own opinion. The illustration of a blindfolded and bound woman indicates a closed mind and all discussion ended. When you demand that people heed your word, people may not be around much longer. The boundaries you set up might be constricting you. The way to wealth is through simple hard work. This card shows you that focus and persistence are limitations that benefit your overall wellbeing. There is simplicity in this card that underscores getting things done. When it is time to work and not play, the focus on the task at hand will bring in positive energy. The boundary of self-discipline is one of great rewards.